Driveway Cleaning Glasgow – The Professionals. 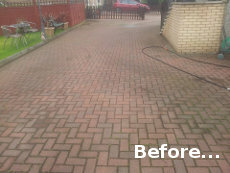 Eco Driveway Cleaning Glasgow are a local, family run business owned and operated by Craig Greig. Our aim is to provide the highest standards of Professional Driveway Cleaning throughout Glasgow, Bearsden, Clydebank, East Kilbride and Hamilton. Eco Driveway Cleaning have earned a reputation for its expertise and for delivering a reliable, friendly, professional cleaning service. We have invested in the latest professional high pressure equipment available to the market. Using powerful petrol pressure washers as well as flat surface cleaners ensures your driveway will receive the best clean possible, while keeping the mess to a minimum. Our approach will leave your driveway looking revitalised and leave your whole property looking cleaner, brighter and more welcoming to visitors. The simple but effective design of our flat surface cleaner ensures that the mess is not spread to the surrounding areas and literally keeps a lid on the debris. The installation of a new driveway can be a great investment adding both value to your property as well as improving the exterior look of the property. This is important not only for business premises but also the family home as it creates an important 1st impression for visitors. Having decided to make what can by a large financial investment it is essential your driveway is maintained. Driveway Cleaning will help protect your investment by removing all the dirt, weeds, moss and algae which enhances the appearance of the driveway and the overall look of your property. It is a difficult and time consuming job removing all the dirt, weeds, moss and algae. Using our high pressure, professional equipment, we can complete this job in a fraction of the time that it would take you to do the job yourself with a store bought domestic pressure washer. We can complete the majority of domestic driveways within a day, although a follow up visit is usually required to brush in the kiln dried sand. The cost for cleaning starts out at £2.50 per square metre. However, the price incrementally decreases, which means that the larger the area the cheaper the cost! For all jobs there is £75 minimum fee. Call Us for Driveway Cleaning Glasgow on 0141 255 1070 to receive the very best price for your driveway cleaning requirements. 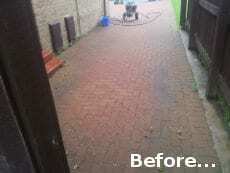 Driveway Cleaning in Glasgow – Restoring Driveways since 2010! Driveway Cleaning Glasgow – How we do it? The process of cleaning the different types of hard landscapes differs slightly depending on the surface type. Essentially the principles remain the same for driveway cleaning with the main difference being the reduced pressure being used on tarmac for example. With years of experience, as well as training ensures we select the right tools for the surface type requiring cleaning. We use our flat surface cleaner alongside our petrol pressure washers to clean the surface of the driveway. We can also control the pressure and flow rate of the water to ensure your driveway isn’t damaged during the process. The flat surface cleaner ensures we keep the mess under control. We will remove items that can be moved from the driveway to ensure no areas are left without being cleaned. This would include items such as wheelie bins, plants or any other items easily removed. Next the driveway would be brushed down to remove item such as stones, leafs etc. from the surface. Unloading and setting up the pressure washer and rotary cleaner is the next step. This will include connecting to a water supply and filling our buffer tank with water. The pressure washer then draws the water it requires from the tank rather than being connected directly to the water supply. Step 3 – Getting Started. Next we will get to work with the flat surface cleaner. Covering the whole area of the driveway to ensure a nice even clean while keeping the mess under control. This will remove the surface dirt, weeds, moss and algae from the driveway. All of which will be brushed away from your drains and into a pile, which allows the water to drain away. Next using the lance we will continue around the edges and any small areas that the surface cleaner perhaps cannot access. A full rinse down is then completed to ensure all surface dirt is removed. Next will then bag and collect any waste matter to save this from entering your drainage system. After the cleaning of your monoblock driveway and allowing the blocks to fully dry sanding will be completed on a dry day. Using kiln dried sand to brush into the joints has a few benefits. 1. The sand is sterile – which helps fight the regrowth of weeds. 3. 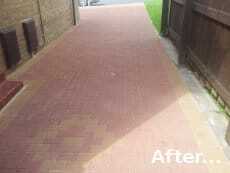 Competes the improved looked of the driveway by filling the joints with a clean, bright sand. It is vitally important that the blocks are fully dried. If the blocks are even a little damp between the blocks it will stop the sand from completely filling the joint. With this in mind, sanding is completed usually a few days after the cleaning process. Sanding can only be completed in dry weather as damp sand is unworkable and will not allow the joints to be sanded fully. You should now have a bright, clean, restored driveway again. Great company, would definitely use again and highly recommend. Our driveway was in a bit if a state to say the least and after a couple of days work by the lovely Craig, our drive was as good as new. Worth every penny. Thanks Craig, see you next year! Mr&Mrs Colquhoun. We had the whole of our driveway and decking at our second holiday property cleaned. It was done to an excellent standard. We rent out this property and have been able to increase the rent we charge because it looks so much better now the driveway and decking look like new. Fantastic. Looking to use again soon for a new property we are about to buy – will be in touch! For anyone interested. If you require your driveway spruced up, this an excellent, friendly service that my mother and I can highly recommend. They are reliable, friendly, with an excellent quality of work and value for money guaranteed. 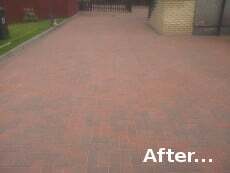 So if you want to sit back and enjoy the summer without worrying about the appearance of your driveway get in touch.